Carol Gray, a consultant for people with autism, created two interventions using visuals to teach social skills. One of them is called Social Stories and the other is Comic Strip Conversations. Using story and comic strips as methods to teach social skills can provide time to reflect and imagine various social scenarios, what others are feeling, and how to respond. These methods use language that children with Autism can process more easily because scenarios are framed more concretely and are less abstract. It clarifies unsaid needs, wants, and rules during situations when people around them are saying things indirectly. At first it may seem simple to creatively draw and write social scenarios out but it is very detailed oriented and structured process that requires a lot of logic and critical thinking, as well as mindfulness of the reader’s perspective. A Social Story is a story that is written with each sentence categorized as either a Descriptive, Directive, Perspective, or Affirmative sentence. Descriptive provides background information about a situation or problem. Directive tell the child how to respond. Perspective describe the reactions of others of what the child does. Affirmative helps the child to remember key lessons and what’s important. These sentences are used to explain the context of specific situation and what to expect and why. Writer gathers a lot of information about the specific situation that is relevant to the reader and writes it in the first person and in a positive and objective way. The stories need to have a beginning, middle and end and be as accurate and specific as possible and have no more than one directive sentence. There’s a lot of rules to follow which makes it tedious but intriguing. I like how the structure provides a crafted technical skill that can be repeated easily to solve challenges for various situations and people. The National Autistic Society, Carol Gray’s website and book all explain the Social Story creation process in much greater detail. Comic Strip Conversations are stick figure comics that have emotions color-coded in the dialogue and different types of speaking bubbles to illustrate when people are interrupting or listening, speaking in unison, yelling or whispering. This PDF illustrates how it works and the National Autism Society explains briefly how to use them. You can read more about Carol Gray’s background on her website as well as see what other publications she has made or even request a workshop from her. Her research and development of these methodologies is such an inspiring and helpful discovery. I read an article written by an OT named Kelly Mahler in OT Advance (Interoception: The Eight Sensory System, June 2016, Vol. 32 No. 6) about a newly recognized 8th sense of the body that could be responsible for our capability to handle the sensations of the inner world of our bodies. It’s called interoception. Interoception allows us to know “how do we feel?” It keeps us aware of whether or not we feel we need to use the restroom, nauseous, hot, cold, sexually aroused, sleepy, in pain, tired from physical exertion, ticklish, hungry, or full. It also keeps us aware of our emotions as well. Those who meditate have stronger interoceptive awareness because through their practice they increase the strength and thickness of a part of the brain called the insula. The insula plays a major role in body-mind awareness and the ability to handle sensations and adjust reactions to those sensations. It may even balance the experience of a sensation, making it less harsh or less dull because being aware of the sensation for what it purely is inhibits the conceptualized story that may exaggerate or diminish it. But that skill takes a long time to develop. It takes a lot of meditative practice to get to the level of awareness of internal sensation that could affect your perception of those sensations. 1. First allow the person space and time to really focus their attention on a specific body part and to ask themselves how it feels. 2. Then the person will look at the Body Check Chart and find the part they were focusing their attention on with the matching description of the sensation. They can use a blank descriptor if none of the others match. 3. The person places the body part where it belongs in the space of their body outline. 4. Repeat steps 1-3 for other body parts. You can start with a smaller number of parts each time and gradually grow to a larger number. You can also start with parts that you can see and gradually add parts that cannot be seen from the outside like the heart. 5. Use the Body Check Chart many times throughout the day. Start with sensations during calm and happy moments if someone is really sensitive. If it’s too challenging to decipher subtle sensations, the person can instead start with checking more intense positive sensations like being tickled or massaged, lifting a heavy grocery bag or touching a warm cup of tea. 6. After noticing the sensations, the person can interpret and give meaning to them by looking through a list of body states and emotions. The person will then find the body states and emotions that best matches with the identified body signals. The list can grow as the person gets more proficient. • Tracing the person’s body and putting their name on it. • Pointing to a body part on the chart and asking the person to wiggle the corresponding area. • Pointing to the body parts in the chart while playing Simon Says. • Making an observation about the person’s body part (fingers tapping, feet shaking, etc.) and labeling it on the chart. • Experimenting with sensations of a body part and describing how it feels like touching different textures and tasting different foods. I enjoyed the article because it inspired me to be more aware of my own body and provided me the possibility of having more control in how I experience it. But mostly I was inspired by the creative and simple strategies to be able to do that with and how I could use those strategies to help my clients. I hope these ideas inspire and help you and those who could benefit from these ideas! Photo is from Ms. Sepp’s Counselor Corner. I’ve recently joined Blogging University which is a WordPress course about growing as a blogger. Neurons and Salads has a lot to offer and I want to be better at making writing for this blog happen. The first assignment is to write a blog about why you are blogging and what your goals are which is why I am writing this post. My intention with this blog is first to help me remember topics that I’ve read and learned so that I can teach others and find a niche for myself. I’m trying to figure out my direction and know what I care about and this blog could act as a vision board and a collage of knowledge I don’t realize I have. Expressing my interest and ideas about different topics can possibly spark other people’s interests. I want to show the amazement of improv, the intrigue of psychology, the mind-opening of occupational therapy. Here’s to new beginnings and a year of learning and exploration! I welcome you to learn along with me. Improv is a form of theater where nothing is rehearsed, no lines have been memorized and anything can happen. It is not only a type of theater but is also a way to learn many important life skills. The philosophy is very supportive, positive, exploratory and therapeutic. The people you work with don’t judge or criticize you but encourage you to share without hesitation. Taking risks in improv is how you thrive. Follow the fear, they say. You confront your fear courageously and bravely learn to be open and vulnerable while asking for what you need. You learn to trust your intuition and be open to possibility like an internal martial artist. Through improv you learn to listen to your partners and have a group mind. You mirror them, respond to them, receive from them, you agree and say yes to them. If someone gives you an idea you take it, add to it and give it back to them. You learn to give gifts and be selfless. You let go of your ego and make sure your partner and the scene look good. You listen to the rhythm and timing of your partners and scene and try to stay connected. You keep the flow. Improv teaches you to work as a team and to make sure that you express your emotions forwardly so your partners can read you. You constantly have your team in mind and are aware how everything that you do affects them. It teaches you to be aware of your body language and the body language of others. Reading and understanding others’ emotions and reciprocating them may help increase one’s ability to empathize with others. You pay attention to needs, desires, intentions, objectives and games in your relationships with others. If there is a conflict in the scene, you and your partners read each others’ bodies and commit to stating ideas as they pop up to resolve the conflict. The possibilities are endless and there are no mistakes. If you feel there are, you make them huge! When you make choices you make them active and strong. This mindset stretches creative thinking when in difficult situations or when facing mental or emotional ruts. Believing there is no such thing as mistakes or to boldly make mistakes can boost confidence in one’s thoughts, feelings, ideas, and decisions. With that group mind you can think on your feet because you are present with your partners and are expanding your focus. There are two types of focus that you learn to activate through improv. One is hard focus, which is when you are narrowing in on your actions and listening to one person intensely. Soft focus has a wider lens of the whole picture of your scene with all the emotions, story lines and possibilities kept in mind. Attention and consciousness can expand and worries about the past and the future can diminish. Freedom from fear and trusting what comes in the moment can relieve pressure and build a sense of security. Being present and supportive of your partners as well as being a good listener also improves interpersonal skills. Showing that you understand and validating the other person helps that person know they are being heard when in the middle of a conflict. Improv also emphasizes being honest and sharing your truth. Being authentic captivates people and allows walls and defenses to drop. It allows people to know themselves and others better to more easily interact with each other as well as let go of internal tension and relax into who they are. Improv teaches you to regulate your speed, tone, volume in order to deliver at a pace that works well with the scene at hand. This can also help when managing stress and emotions when under pressure. It can also help with improving how you present yourself when doing public speaking or an interview or are on a date. You are encouraged to embrace the unknown, to be humble and silly, to play, to take in everything with a sense of awe. You are a fool and a baby, two very happy characters. You learn to see things as if you’ve never seen them before and are filled with curiosity. You learn not to hold onto things and when to let things go. You listen to your gut and your natural instincts. It teaches you things that you spend your whole life time learning. Improv teaches a lot of interpersonal skills but it also teaches a lot of other types of skills as well. It teaches how to multitask by keeping your hands and body active and busy in an imaginary world you have to remember while listening and responding to your partner. Improv teaches you to pay attention to daily life and how you and others around you move, function and interact with the world. You learn to observe the details of how people hold their bodies and faces or how they hold a cup or a cat. This is a very important skill for all artists as well occupational therapists who need to know all the mechanics, facets and realities of daily activities. Skillfully observing life helps one to make things feel real and familiar to others. 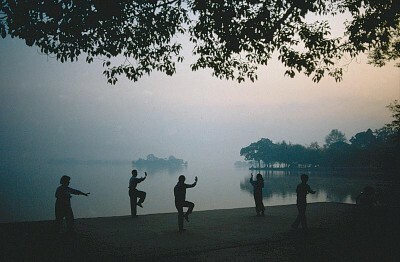 It also teaches one to be more mindful while doing activities and to enjoy them without haste or carelessness. Another skill improv supports is storytelling. We all play our stories in our head over and over about who we are, our lives, our jobs, our families, our futures, our pasts. What we don’t realize is the multiple perspectives we can have when looking at the same thing. Improv teaches you to take on new and unexpected perspectives and form spontaneous narratives that you may have not otherwise thought of because someone added a new direction to your thought and shifted the story’s whole direction. Improv also illustrates how easy it is to create a story out of nothing. It’s a great way to brainstorm and exercise the brain to think in that creative mindset. Improv can help people with creative blocks find how the content of an idea or a story evolves through the setting, relationship, character, emotion, movement, pose, prop or through many other possible techniques. The creative juices slowly are coaxed out until they are poured into the moment of the scene. Improv can be a very therapeutic tool if you are hoping to be more creative, playful, supportive, authentic, open to possibility, present, mindful, grounded, self-aware and receptive towards other. It can help people with their social skills and build their confidence. Most of all it can help people connect to each other and have fun. In the Occupational Therapy (OT) world, sensory integration is a very popular philosophy in addressing pediatric issues across many areas of function. Sensory integration is the therapeutic approach to resolve sensory imbalances, whether someone perceives too much or too little from the world around them, by providing opportunities for people to interact with sensory stimuli in a safe environment. There is some controversy with sensory integration given that it is difficult to collect quantitative data on the evidence of its effectiveness, however this does not change its predominance in OT clinics. This discrepancy could be due to the fact that there is so much variation in the personal sensory issues that people face. I say people instead of children even though sensory integration is most often used with children, because it doesn’t negate the fact that many adults have a need to balance their sensory intake. Adults who are simply very sensitive or clumsy, or have experienced trauma, PTSD, anxiety, or any mental health challenges may benefit from integrating their senses more effectively. The psychological nature of sensory integration challenges may contribute to the difficulty of quantifying the effectiveness of treatment. Sensory stimuli travels through the peripheral nervous system and sends information to the central nervous system where the brain will perceive the stimuli. This back and forth messaging between the external world and the brain is where the translation can get messy. This is also where a philosophical debate can occur about the question of reality, or “Is there a reality?” since everything is an interpreted personal and internal experience. In any case, there are some personal internal experiences that cause much discomfort and dysfunction. So first let’s look at all the senses that sensory integration addresses. First off, most people know about the five senses of sight, taste, touch, smell and hearing, but there’s more! One is proprioception. This is the silent and very important sense of knowing where your limbs and joints are in space. This is very important for not injuring yourself in any sort of movement, whether walking, biking or reaching for a hot cup of tea. Knowing your position can give you insight and body awareness to help you predict and calculate your next move. It also helps you know how hard to press down on things like when writing or drawing or giving someone a hug. The other is the vestibular system. This is how you sense your movement in space, which means detecting how fast and in what direction your body is moving. You know that sick feeling of being in a car or on a boat or on a tire swing? Say thank you to your vestibular system. Some people feel that sick feeling just walking up the stairs. That dizzy, nauseous feeling can get out of hand. It also can make people fall. And some people crave that feeling and seek that input to really sense their own bodily movement, but can never get enough of it. There is not one thing that you do that is not affected by your senses. Eating, sleeping, working, commuting, shopping, chores, socializing can all be compromised by poor sensory intake. Someone may be overwhelmed by loud sounds, strong smells, bright lights and others may be bored stiff because nothing is loud enough or strong enough for them. Some people feel destabilized by the lack of intake and feel anxious because nothing feels firm enough to keep them rooted in their bodies. This is why a “sensory diet” may be needed to reprogram the nervous system. Below you will see a list of activities that people can include in their sensory diet and what senses they address. These Ted Talks are as informational as they are inspirational and shed light on an aspect of wellness that sometimes gets forgotten. Everyone knows wellness has much to do with diet, exercise, ergonomics and stress reduction, but it also has to do with deeper parts of our minds that might be difficult to access directly. These Ted Talks will give you some insight into how to tap into the subconscious and make this important part of your being healthier and more at peace. Eleanor Longden, a research psychologist with schizophrenia who shared her experience on TED, spoke of how she used a disciplined courageousness to face the demonic voices in her mind. She learned from her psychologists that she needed to ask these voices what they needed and stop fearfully running away from them because they were parts of herself that she was unable to reach consciously. These voices came from being deeply hurt and they needed to know that no one is out to get them and they were not alone. Coming from this place of feeling compassionate for what makes you afraid or uncomfortable is the same for panic disorder, anxiety, pain and many other mental and physical health challenges. It’s a special type of discipline to let go of control. McGonigal said in a TED Q&A about willpower, “When you try to control the things that aren’t really under your control, you get to feeling more out of control.” Being focused gives you the courage to drop the rope, end the fight or flight response, face the scary place with the same compassion you would give anyone you care about, even yourself. We are surrounded by subtle suggestions. We are constantly copying other people’s behaviors, intonations and body language subconsciously via mirror neurons, but we also influence our own subconscious. The way we practice body language, facial expressions, handwriting, vocal tones and self-talk creates a self-perpetuating loop between our conscious and unconscious selves. These modalities are avenues to express the language of the limbic system. If you talk to yourself with slumping shoulders and frowns, it’s going to make you feel like slumping and frowning. However, if you interrupt the loop by physically contradicting your internal state by initiating a conversation with yourself with a fake smile, your subconscious will slowly return the gesture with a polite smile of its own accord, almost accidentally. Amy Cuddy, a social psychologist on TED, stated how having a power stance with your hands on your hips for two minutes can dramatically lower your cortisol levels. An external physical suggestion can create a different message in the body. Being able to challenge the loop and keep persistent awareness of how one is constantly interplaying with his or her state of mind can help make choices and build internal and external habits that impact your efforts long term. Can nurture change the nature of the subconscious? Alanna Shaikh, a global health and development specialist, shared on TED how she was preparing for her own future with Alzheimer’s. She described how she is trying to make a long term impact on her unconscious so her future self will be a better person than she is now without her conscious mind. She said that with Alzheimer’s the heart becomes naked without the mind. Nature and nurture both play a role in developing the naked subconscious mind but it is questionable whether someone can change their fundamental temperament. There is research however that shows how the amygdala (the part of the brain responsible for empathy and emotion) and other parts of the brain in mice grew when the mice were placed in stimulating and social environments. Daniel Reisel, a neuroscientist, explained on TED that this research could also potentially impact our justice system by giving prisoners who are sociopaths the opportunity to be in an environment that may physically change how their brains are wired to prevent them from reoffending. It is not quite certain the extent nurture has on nature but it is known that it does have an effect. Overcoming one’s nature is something that needs to be done with compassion and diligence. It’s not about fighting who you are but strengthening something that you already are and becoming more authentic to that part of yourself.